AMMONNEWS - The United Arab Emirates views "All human beings as members of one global society," the Minister of Tolerance, Sheikh Nahyan bin Mubarak Al Nahyan, said today. 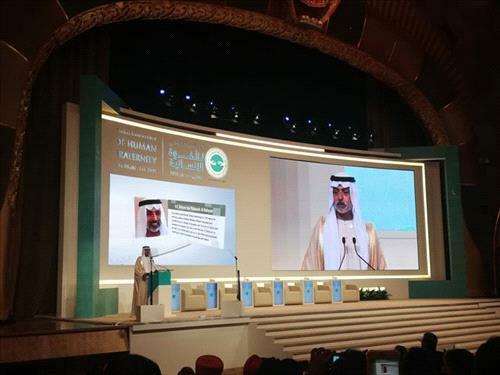 Addressing the opening session of the Global Conference of Fraternity, being held in Abu Dhabi, Sheikh Nahyan noted that tomorrow the conference will be joined by Pope Francis and by Dr. Ahmed El-Tayeb, the Grand Imam of Al Azhar. "We are honoured by their inspirational presence," he said. "We welcome them in the tradition of Arab hospitality. His Holiness the Pope and His Eminence the Sheikh of Al Azhar are global forces for compassion and peace. They exemplify the moral force that we all must exert if we are to meet the great global challenges of this twenty-first century. Their participation in this conference speaks eloquently to the power of tolerance and human fraternity." "Good Morning, Your Excellences, World Leaders, Distinguished Guests, Ladies and Gentlemen: We who live and work in the United Arab Emirates are delighted to welcome all of you who have traveled from abroad to Abu Dhabi for this Global Conference on Human Fraternity. I am confident that I express our shared joy that we will be joined tomorrow by His Holiness Pope Francis, Pope of the Catholic Church, and His Eminence Dr. Ahmed El-Tayeb, Grand Imam of Al-Azhar Al-Sharif and Chairman of the Muslim Council of Elders. We are honored by their inspirational presence. We welcome them in the tradition of Arab hospitality. His Holiness, the Pope, and His Eminence, the Sheikh of Al Azhar, are global forces for compassion and peace. They exemplify the moral force that we all must exert if we are to meet the great global challenges of this twenty-first century. Their participation in this conference speaks eloquently to the power of tolerance and human fraternity. You also represent that power. You leaders have assembled here as an extraordinarily diverse international group of brothers and sisters. You represent the difference and the diversity that exemplifies humanity. You are joining together in examining the three themes central to this conference, namely: · Principles of Human Fraternity, · Common Responsibility to Achieving Human Fraternity, and · Human Fraternity Challenges and Opportunities. Your various beliefs, convictions and experiences will guide you in your discussions. Despite the differences inherent in any international dialogue, you will proceed in the spirit of human fraternity. This conference is truly a multi-cultural event that builds on a tolerance which enables and encourages empathy, compassion, dialogue, understanding, and respect. You will constitute, in effect, a global alliance dedicated to identifying actions that will reaffirm shared values and combat the destructive forces of extremism and terrorism, poverty and malnutrition, degradation of women, environmental abuse, illiteracy, prejudice and hate, scientific and technological ignorance, distrust and oppression, lack of sanitation and healthcare, and greedy selfishness that oppose the very idea of a human fraternity. Your participation in this conference proclaims your recognition that we are all human, irrespective of our nationality, language, culture, religion, ethnicity, gender, physical appearance, net worth, or political philosophy. Ladies and Gentlemen, this Global Conference on Human Fraternity provides a rare opportunity for you to unleash the power of your combined wisdom. The components of wisdom are reasoning ability, learning from ideas and the environment, judgment, expeditious use of information, and keen understanding. Wise people tend to be well-informed and receptive to new ideas and concepts. Wise people exhibit exceptional insight into human development and life matters and they can communicate their wisdom effectively. And wise people recognise the virtues of diversity and difference. In the United Arab Emirates, we saw wisdom personified in our Nation’s Founder, the late Sheikh Zayed bin Sultan Al-Nahyan, known widely as "the Wise Man of the Arabs." He was a free and creative thinker. He accumulated knowledge and drew on it habitually. Always eager for new ideas, he was not reluctant to adjust his body of knowledge as he added new or conflicting facts. Accumulating that knowledge, he also honed a reflective and farsighted judgment that was well-grounded in practicality and an unusual ability to see through and understand puzzling matters. Wisdom has continued to mark the leadership of the United Arab Emirates, much to our great fortune. Our President, His Highness Sheikh Khalifa bin Zayed Al Nahyan, The Vice President, Prime Minister and Ruler of Dubai, His Highness Sheikh Mohammed bin Rashid Al-Maktoum, and His Highness Sheikh Mohammed bin Zayed Al Nahyan, Crown Prince of Abu Dhabi and the Deputy Supreme Commander of the Armed Forces, have appreciated the value of wisdom and have cultivated the attributes that lead to wise actions. We in the United Arab Emirates are proud of our Arabic-Islamic heritage. It has enabled us to engage our diverse population and become, in effect, global citizens. We have welcomed people from all corners of the earth. They live and work with us safely and peacefully under our welcoming Arab tent. We have engaged them in dialogue, sought to understand our differences, and rejoiced in our shared values and humanity. We have come to view all human beings as members of one global society. Ladies and Gentlemen, I stand before you today as the Minister of Tolerance in the United Arab Emirates. I stand before you as the official emblem of my country’s commitment to tolerance as an essential component of our society. I stand before you as living evidence of our continuing commitment to tolerance. We know that tolerance does not flourish in the absence of wise actions. We are trying to be wise. For example, my ministry and my country are focused on ensuring that the educational experience of the young men and women in the UAE results in their comprehending the virtue of tolerance and the way in which tolerance leads to a correct understanding of the identity and difference of human beings. We are likewise concentrating on promoting tolerance in all forms of communication. We wish to build local and global partnerships based on a tolerance that seeks diverse ideas that can adjust to one another in pursuit of human fraternity. Our wise leaders who created a Ministry of Tolerance have designated this year 2019 as the "Year of Tolerance." Our reverent regard for tolerance makes the United Arab Emirates eager to join with other countries and organisations in support of tolerance, pluralism, and peaceful and mutually beneficial coexistence. We are ready to share our experience and to gain from others a wider understanding of the universal power of tolerance. Of course, this wonderful conference gives us that opportunity. Ladies and gentlemen, here in Abu Dhabi today, you are part of a rare and unusual event, one that is truly historic. You have come together in an extraordinary opportunity to demonstrate to the world just what the power of tolerance and human fraternity is capable of achieving. I believe that tolerance and human fraternity have the capability to solve most of the world’s great global challenges. Yes, we live in difficult times with new and unforeseen challenges confronting local and global communities. As societies around the globe strive to improve their quality of life, unfortunately, they confront a myriad of challenges. Issues such as global climate change, waste management, recycling, adequate food, potable water, and renewable energy sources become increasingly important to sustaining the quality of our environment. Many adults around the world, most of them women, lack even the most basic literacy skills, and many children currently are not in school. Further, and sadly, there are many conflicts over geography, resources, water, religion or political beliefs in many parts of the world. But tolerance and human fraternity possess the power to deal with all these challenges. It will be tolerance and human fraternity that will recognise the moral imperative for improving the health and safety of all individuals. It will be tolerance and human fraternity that will enable cooperation, understanding, and mutual respect among different groups and cultures. It will be tolerance and human fraternity that will help us deal reasonably with important environmental issues. It will be tolerance and human fraternity that will help solve conflicts and political disagreements. It will be tolerance and human fraternity that will help improve education and encourage innovation so that all citizens can contribute to a knowledge-based economy. It will be tolerance and human fraternity that will make us champions for human rights and human obligations. And it will be tolerance and human fraternity that will assist in preserving our own heritage, and strengthening our own cultures, and making us all proud of our national identities. Ladies and Gentlemen, it is my aspiration, and I hope yours as well, that this conference, and its outcomes, will become known as a landmark event in the improvement of global human relations and fraternity. In short, it is our responsibility to work together to take up the banner of peace and preservation of human dignity and development of our local and global communities. Thank you for your resolve to work to develop new strategies for how tolerance and human fraternity can be unleashed to solve the great global challenges that confront our very humanity. My best wishes for your success."